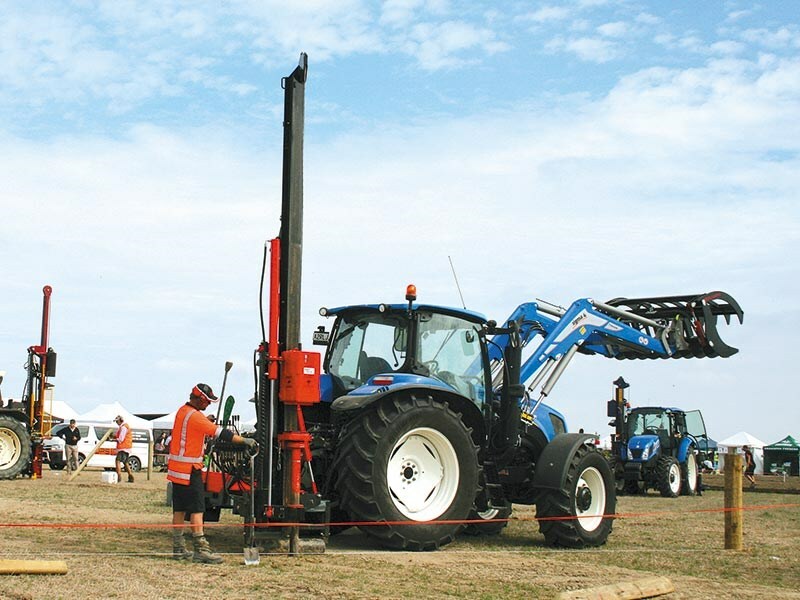 New Zealand-made post drivers came under the spotlight at the inaugural Battle of the Bangers event, held recently at the South Island Agricultural Field Days. 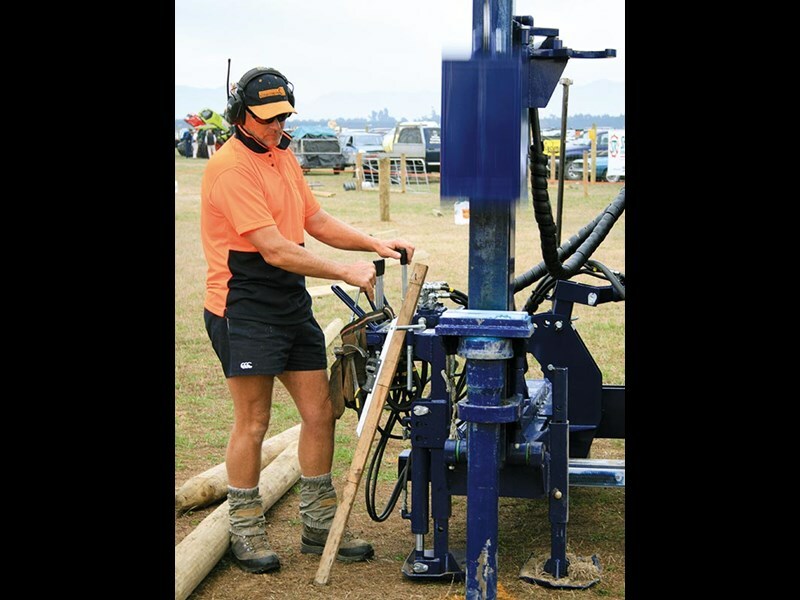 Organised to promote New Zealand-made post drivers, the machines were put to work by professional fencing contractors, installing the strainers and posts to industry best practice criteria for the NZFC South Island Doubles Fencing competition. 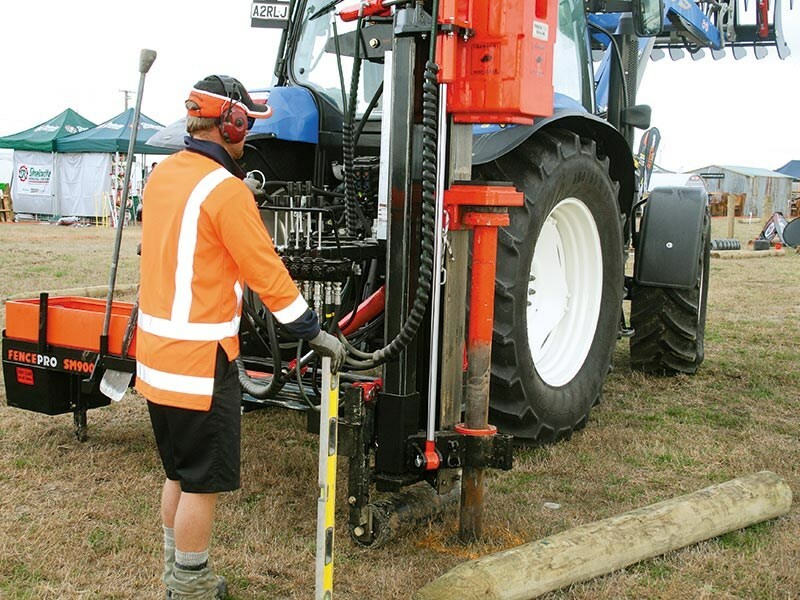 Ground conditions at the Kirwee site delivered authenticity, reminding operators that Canterbury has some of the toughest ground conditions for fencing in New Zealand. Taege entered a rear mounted contractor model, which was set up with a 4.6m folding mast and 375kg hammer. The base had 300mm of side shift, with hydraulic legs working off a centre end shift cylinder. The 90mm Rock spike had a spike turner and the machine weight was approximately 1050kgs. Taege operator Rod Menzies has been working this region for the past 12 years and operating Taege machinery for around a decade. Being used to the conditions, Menzies was insistent on watering, which proved crucial. Taege representative Ian Haywood provided a watering cart and 20-litre containers. Menzies has found the Taege brand is built to handle these conditions, they are simple and easy to operate. Fencepro entered an Ultra G2 rear-mount with 4.5m hydraulic hinges mast, 300kg hammer and a farside of the mast located hydraulic turn Rock spike, with a total machine weight of 800kgs. The Side mount was a Ultra G 3 with a 4.8m hydraulic hinged mast, 350kg hammer and 350mm mast shift on a 800mm side-mount base and a total machine weight of 1300kgs. 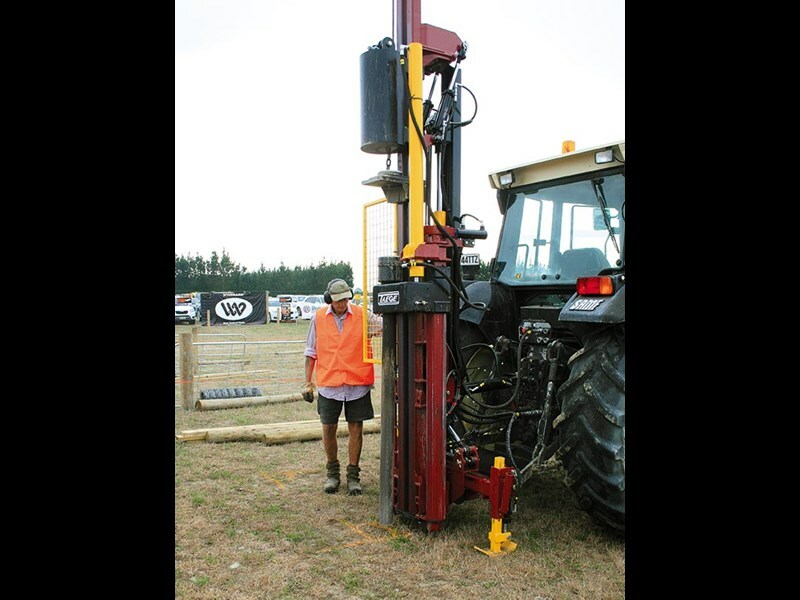 Fencepro operator Julian Collins, from Manawatu, found Battle of the Bangers a "good challenging situation", a perfect reflection of the situations contractors have to deal with, including variances in the ground conditions. "With these conditions, you need good decent post drivers like the Fencepro and plenty of patience in order to get through the hard layers," says Collins. "Using water is something I've heard of but not tried." Revolution Postdrivers entered in the side mount category a Revolution Telescopic SS with 300kg hammer, 900mm sideshift, 900mm forward aft and auger Rock Spike kit with a total machine weight of 1500kgs. In the rotation division their Revolution Telescopic 180 had a 300kg hammer (having sold the 330kg hammer days before to one of their customers who wanted one at short notice), Auto Rock Spike kit and a total machine weight of 1200kgs. Revolution's Tony White found the first of the three laneways he posted the hardest and least forgiving, concentrating on the brief to keep the posts and strainers level and plumb for the fencing competition. "It was great working alongside other post drivers and for the public to see the different models working," says White. "There were pockets that seemed impenetrable and I was spiking to around 800mm for the posts and 1400mm for the strainers. "In order to get them out after the fencing competition, 2.1-metre 200 SED strainers were used. Watering before the post/strainer was driven helped immensely." When the post drivers weren't posting on the laneways, they were accessed by Ivan Stratford of Windust Hydraulics, who commented that the valve banks were well set up with very good identification labelling and some of the hoses required a few adjustments in their layout. The Farm Trader team of Brent Lilley and Jaiden Drought also evaluated the post drivers and their feedback will be published next month. "This was an inaugural event, though I have run All About Fencing, another fencing industry event within Field Days," says Battle of the Bangers organiser Debbie White. "The promotional aspect for New Zealand manufactured post drivers worked well and we plan to add more depth to the event next time. 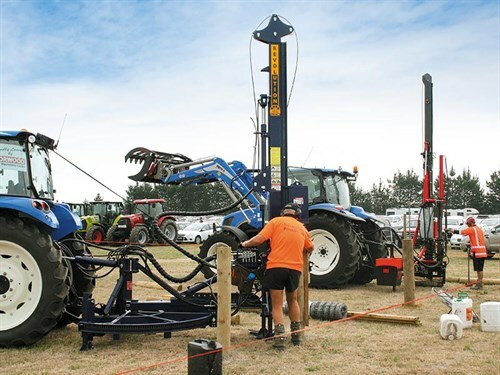 "The involvement of sponsors Brevini and Easysteel represent the type of company supplying components to localised engineers, while New Holland tractors helped show off the post drivers to the fencing market. 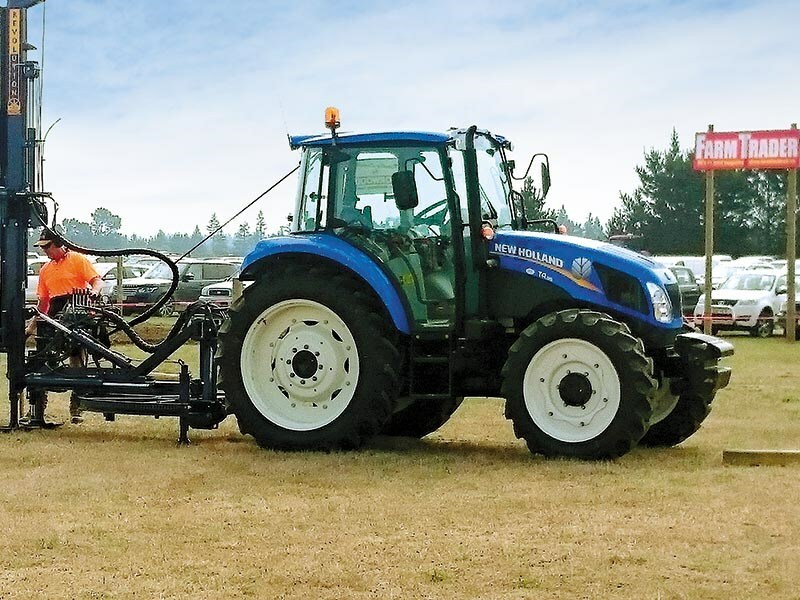 "The South Island Agricultural Field Days welcomed the All about Fencing/Battle of the Bangers concept and their attitude helped create the success. Farm Trader has also been very supportive recognising the machinery fit with its audience." For a more in-depth report on the post drivers featured in the Battle of the Bangers, check out our next issue of Farm Trader. Subscribe here.